Quite naturally, most of the cinema's great names are actors but occasionally a producer reaches true, lasting, star status. Walt Disney's name is as big as that of his great characters - Mickey Mouse, Donald Duck and the rest - and the Disney tradition has not ended with the maestro's passing for, from the Disney studio in Hollywood and locations around the world, streams a constant flow of cartoon features. Jungle Book is the latest in a long line of Disney masterpieces and was, in fact, the last to be personally produced by Disney himself. It was, indeed, the culmination of 30 years' experience in cartooning, using all the time-proved techniques whilst also representing a completely new approach in design, style and concept to capture the lush, colourful and spectacular adventure of life among the animals of the jungle. Ever since his first efforts flickered across the screen in 1926, Walt Disney was the leader in developing the artists' dream of presenting a fluid movement of animated drawings in the cinema. He had the vision of a true pioneer, seeing the vast possibilities of the cartoon medium for exploiting not only far-fetched comic situations but life itself. From the early triumphs of Mickey Mouse, Walt Disney went on to the memorable Snow White And The Seven Dwarfs, Bambi, Cinderella, Pinocchio, Lady And The Tramp, Sleeping Beauty, and Fantasia, among others. With One Hundred and One Dalmations in 1961, Disney introduced a new process, xerography, which transfers original drawings to celluloid, eliminating the time-consuming process of hand transferring. A system he developed for combining live-action with animated cartoons produced The Three Caballeros, Song of the South and the triumphant Mary Poppins. 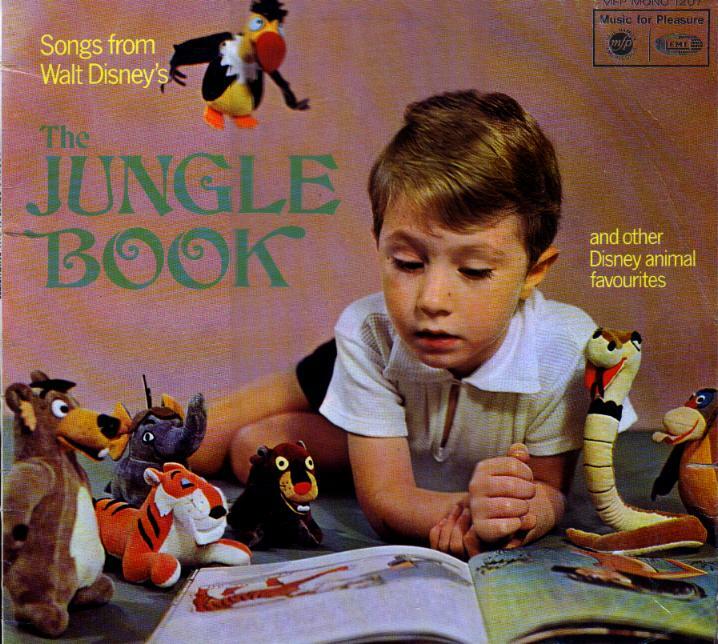 Jungle Book too brought new developments with the strong personalities of the cast chosen to speak the voices, slowly taking over and deciding the development of the characters' personalities. The mannerisms of long-established TV, radio and night-club and film star Phil Harris dominated the picture's indolent character of Baloo, the bear, the jungle's easy-going layabout who is a past master at the art of avoiding work and effort. Sebastian Cabot, who has spoken in many Disney films, gave voice to the pompous but dedicated panther Bagheera who is determined to get the man-cub, Mowgli, back to his own people, while gravel-voiced jazzman Louis Prima moulded the personality of King Louis the Most, the ape potentate of Jungle Book. George Sanders, the suave Russian-born Englishman, gave voice to Shere Khan, the tiger, and Sterling Holloway's wistful personality infused the character of Kaa, the sneaky python. All the other members of the cast exerted real influence on their characters and the result was a film of great charm. Based on Rudyard Kipling's 'Mowgli' stories, Jungle Book tells of the boy who wants to live his life among the animals of the jungle. Mowgli is found in the jungle by a pair of wolves who have raised him in the ways of the wild. He has never seen man or the man village but, when Shere Khan - the ferocious tiger - returns to the wolves' hunting grounds, the leaders of the pack decide that the boy would be safer among his own people. Bagheera, the black panther, volunteers to take Mowgli back to civilisation and sets off with the protesting youngster. At nightfall they find shelter in the boughs of a great tree but they are not completely safe for, scenting a tasty meal, Kaa, the python, tries to hypnotise Mowgli. He is foiled by the two friends who successfully defend each other. They awaken next morning to the sounds of the elephant herd who are being drilled by their leader, Colonel Hathi. The delighted Mowgli tries to join in, much to the annoyance of the Colonel, and is only just saved from court martial by Bagheera's intervention. Mowgli's high-spirits finally drive the exasperated Bagheera to desert him, but the boy is immediately befriended by the rascally bear Baloo who sings and dances his philosophy of life, The Bare Necessities. Mowgli goes off down-river with his new companion but is kidnapped by a band of monkeys and taken off to a ruined temple to meet the rather dim ape-king, King Louis the Most. The King, who suffers from delusions of grandeur and believes himself to be almost human, eagerly welcomes the boy and offers to let him stay in exchange for man's 'secret of the red flower' - fire! Bagheera and Baloo arrive to retrieve the boy, with Baloo disguised as a glamorous ape to aid the plot, but he is discovered and the three friends are forced to flee. Baloo has by now convinced Bagheera that Mowgli should be returned to the human village and Mowgli, feeling his friend has betrayed him, runs away. Subtle persuasion (actually his wife threatens to take over command of the herd) persuades Colonel Hathi to help Bagheera and Baloo in their search for Mowgli, but they do not realise that the sinister tiger, Shere Khan, has overheard their talking and has himself decided to track the boy down. Near the Black Pool, Mowgli wanders upon some beatnik vultures who spend their days lounging around waiting for something to happen. At first they are only intent on teasing the boy but then they try to cheer him up with That's What Friends Are For. Suddenly the ferocious tiger arrives and sends the vultures fleeing. Mowgli is now at the tiger's mercy but Baloo arrives in the nick of time and fights to save the boy. Baloo is badly mauled and seems to be dead but while the tiger is busy fighting, the vultures pull Mowgli to safety in a tree. A terrible storm is raging and lightning catches the tree, making it burst into flames. Knowing Shere Khan's fear of fire, the vultures tie a firebrand to his tail and he flees in terror. The danger is past taut everyone is saddened by Baloo's presumed demise. Bagheera stands over the body and delivers a moving funeral oration but the bear opens a twinkling eye and laughs: "You better believe it!" With Shere Khan now driven off, Mowgli is happy again, thinking he will be able to remain in the jungle for ever but the friends have strayed close to a man village and a 'girl-cub' appears on the scene. Mowgli is entranced and quickly makes friends with her and wanders off to the man village leaving Bagheera delighted at the turn of events.